How stress is read in your brain and blood chemistry becomes better understood as the brain is mapped. A recent study of interest looks at the intersection of the nervous system and acupuncture. In order to understand what the study is about, a brief overview of brain anatomy and physiology will be helpful. The hypothalamus-pituitary–adrenal-axis (HPAA) is a region in the brain that has to do with regulation of a multitude of body functions, from immunity, to reproduction, digestion, and temperature regulation. The sympathetic nervous system (SNS) is our “fight or flight” system that helps us survive. 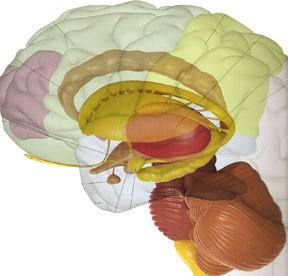 The hypothalamus acts as the intermediary between the nervous system and the endocrine system. The pituitary is the body’s major endocrine gland. The hypothalamus-pituitary-axis and sympathetic nervous system work ceaselessly to attain and maintain homeostasis, the natural state of equilibrium, in the entire body. In this study, the hormones and neurotransmitter measured were obtained by blood tests over 10 days. Specifically, the two hormones measured in the study discussed in part 2 are: ACTH (adrenocorticotropic) and CORT (corticosterone) from the HPA. The peptide (a compound of amino acids which are the basis of signaling molecules in our body) which measured from the sympathetic nervous system (SNS) is NPY (neuropeptide Y). Got that? No pop quiz here, just remember that ACTH, CORT, and NPY are present in abundance when the both systems are activated. Read the study here to get a sense of how acupuncture impacts the nervous system.